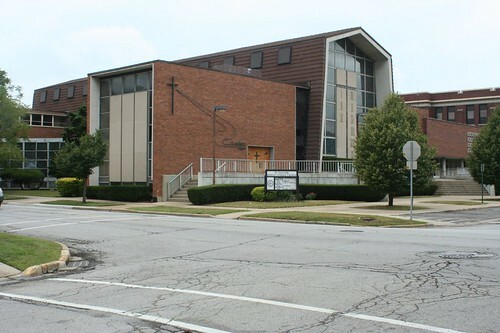 St. Gertrude (9613 Schiller Boulevard, Franklin Park, west side) isn’t all that striking from the outside. It has bold massing and a strange hipped A-frame structure that makes it resemble a giant tent, but everything on the outside essentially exists to service the spaces inside. And what spaces they are! 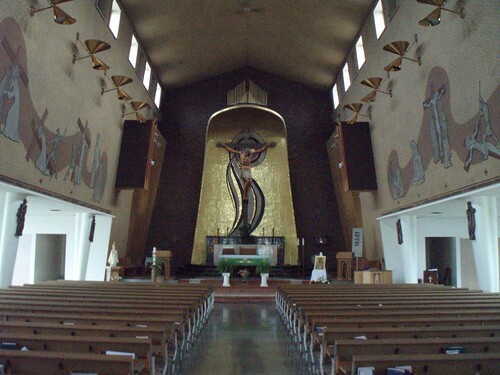 With its Flagrantly Fifties styling and decor, St. Gertrude has become one of my favorite local churches. 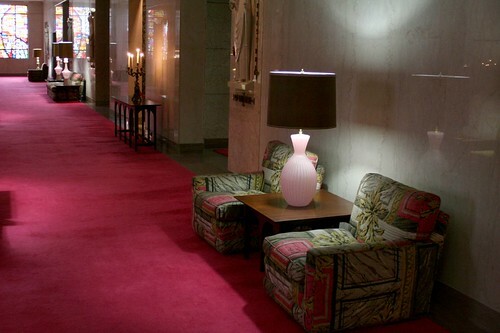 It’s not just decorative flash, either. The architects pull a pretty slick little trick with the side aisles. 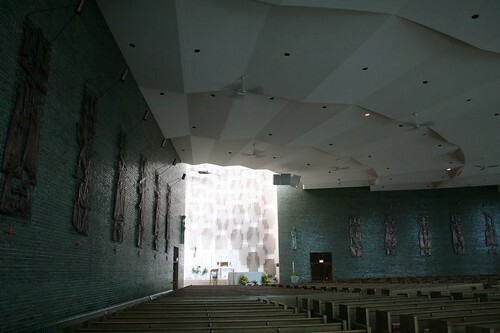 Though the walls are a solid mass descending from the ceiling, they suddenly stop about ten feet from the floor, leaving only slender tapered columns to hold up the towering height above. 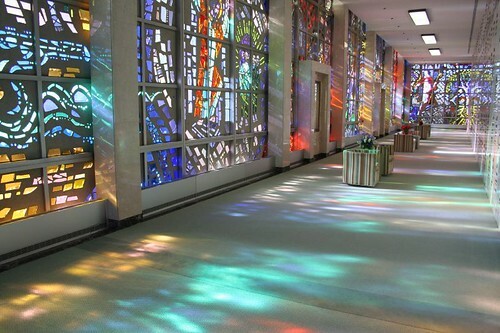 The openings allow the floor space to expand outward, where a solid wall of stained glass creates a beautiful space. Because so much visual and actual weight is crushing down on those columns, you kind of expect something similar to be happening with the side aisles. 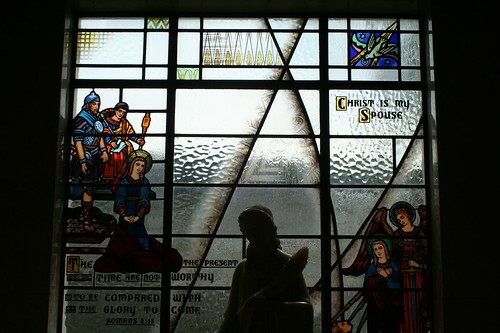 I stared at that stained glass side wall for a very long time, trying to figure out what held up the roof. Turns out the thicker window mullions are structural — there’s nothing above the ceiling, and no other columns anywhere. As if that wasn’t enough, the balcony floats freely across the sanctuary, a bridge supported only at its ends, as seen in the sanctuary view at top. 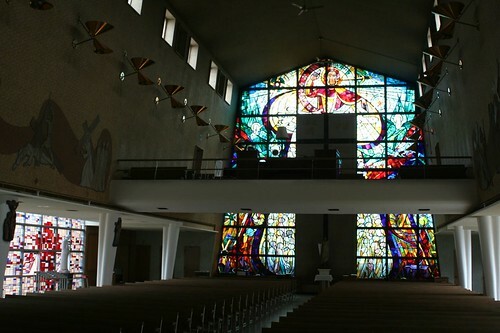 The lovely stained glass was designed by Peter Recker for Conrad Schmit Studio. 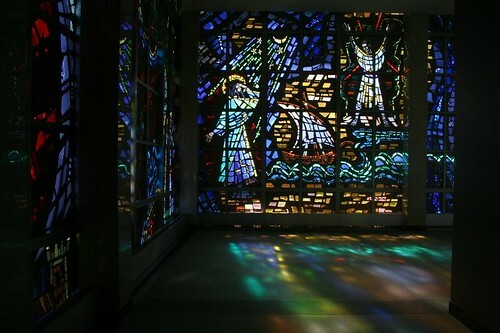 A cavalcade of Judgement Day images cascades down the rear wall of the sanctuary (and you can tell Recker is fighting against that grid of window mullions — look how Jesus’s head is located just off-center), but it’s the sidewalls that I love best, where light is filtered through a dazzling array of abstract color patterns. 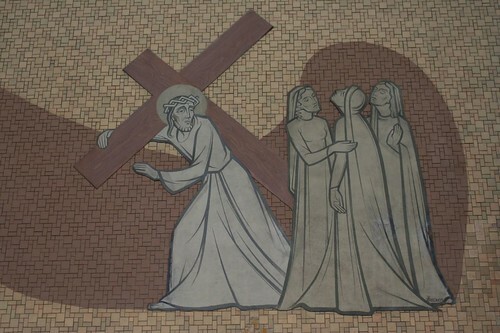 Recker also did the Stations of the Cross. 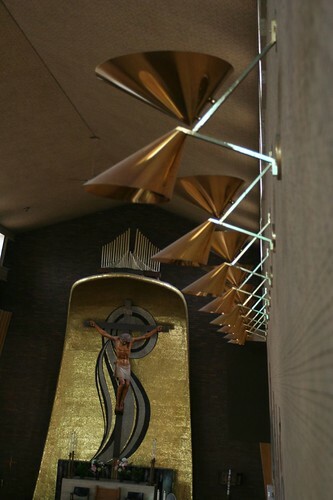 The curved wall behind the crucifix bears a startling resemblance to the focal point in the chapel of St. Joseph Hospital, and sure enough, it’s by the same architecture firm, Belli & Belli, who were responsible for a lot of the most awesomely crazy Modernist buildings in Chicago and its suburbs. Plenty of spaces beyond the sanctuary offer interest as well. The protruding wings contain foyer space and stairwells to the balcony. 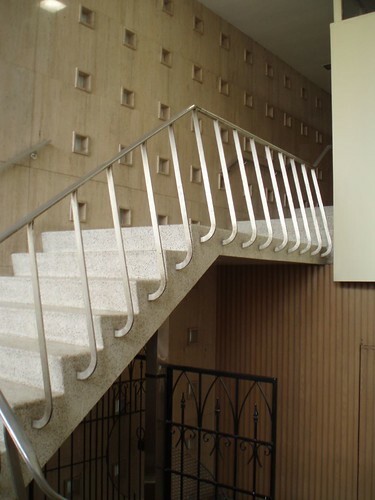 The stairs are floating masses of terrazzo, with stylized railings, rising alongside a wall flecked with a grid of small window openings. Elaborately worked iron gates stand nearby as well. The east wing contains the only real aberration in the building; a bathroom has been rather clumsily and awkwardly shoehorned into the end of the wing, complete with a false ceiling that one can look down on from the stairs. On the balance, it’s a minor complaint, though. I love a lot of church buildings, but this is one of the few that keeps me going back again just to absorb its spaces and soak in its architectural glory. As much as I love historicist styles, at some point, it becomes clear the jig is up and it’s time to move on. 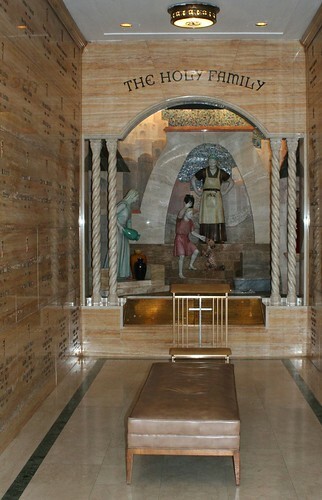 Here, for example, we have Queen of Heaven Mausoleum, begun in 1956, and first opened in spring of 1957. It’s a French Gothic styled building. Well, French Gothic Revival. Okay, Neo-French Gothic Revival, since Gothic had already been “revived” as an architectural style about a hundred years earlier. 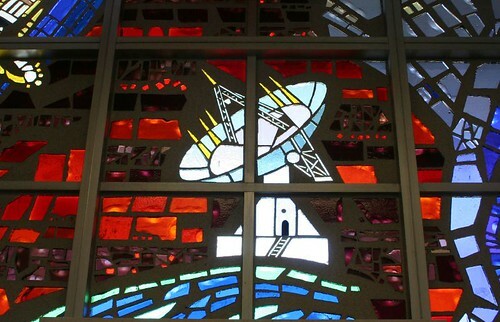 When it was built, World War II was 11 years in the past, televisions were becoming widespread, and Sputnik and the Interstate Highway would be coming down the pike very shortly. 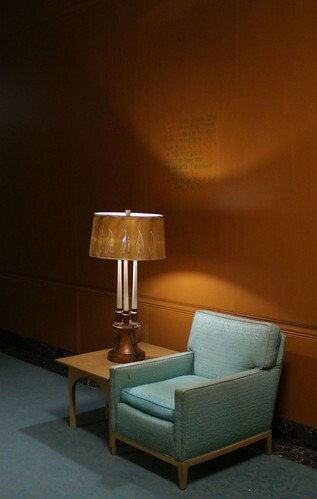 Art Deco and Streamline had already come and mostly gone. I mean, really. Who was building French castles in 1956? 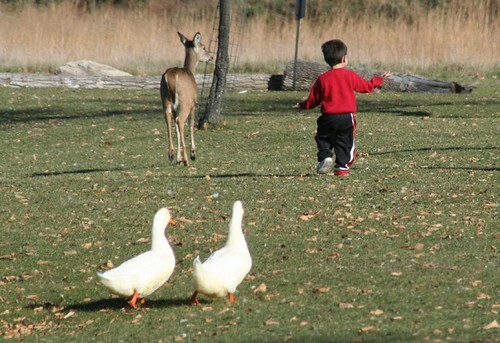 So I wasn’t expecting much when I ventured inside the place on a recent Sunday afternoon. 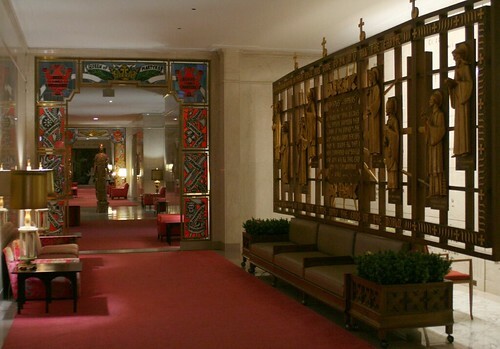 Faux Gothic archways would surely get old after a little while, right? Probably so, but that’s not what I found. Inside its historicist shell, Queen of Heaven contains a cross-section of contemporary artistic thought circa 1960, and it is glorious indeed. 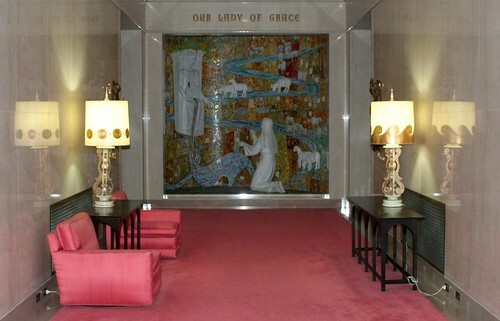 35 different kinds of marble are used in the interior finishes, and its corridors are lined with a dazzling array of contemporary religious art and iconography. 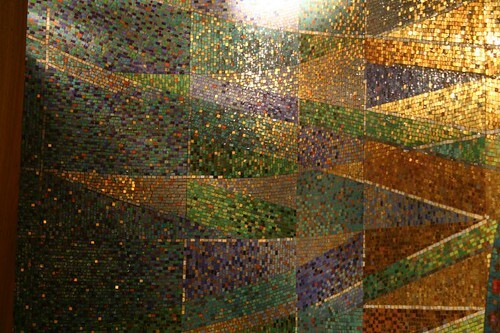 Stained glass, metalwork, wood carving, stone sculpture, paintings, and mosaic tile are integrated throughout the building. 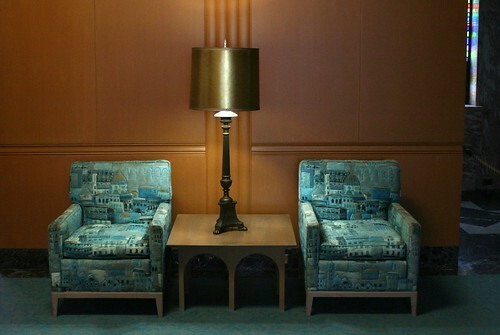 No one style dominates, but nearly all of it is touched by the stylized trends of the 1950s. And there is a ton of it. 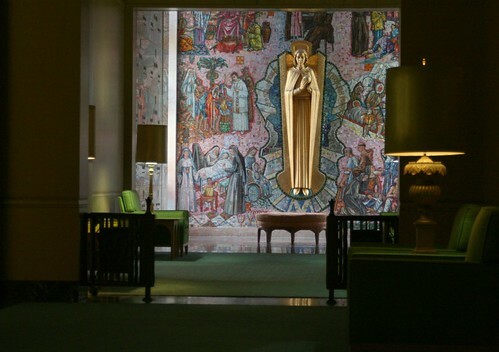 Queen of Heaven, built in three stages from 1956 through 1964, is the largest Catholic mausoleum in the world, and it is vast. 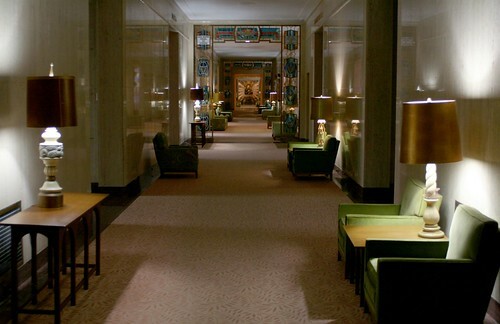 One contemporary account puts the three floors of corridors at over a mile in total length, and it’s not hard to believe. 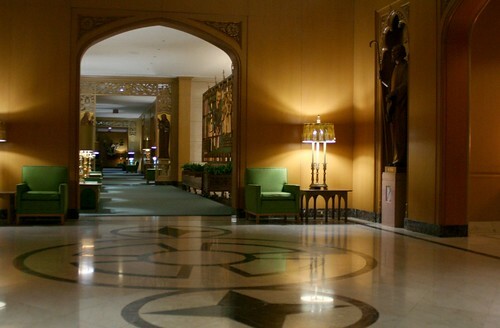 Much of the artwork (if not all) may be attached the Studios of Daprato Statuary Company, with offices in New York and Chicago. Daprato Studios ran an ad in the Chicago Tribune in 1961, proudly proclaiming their role in the vast undertaking. 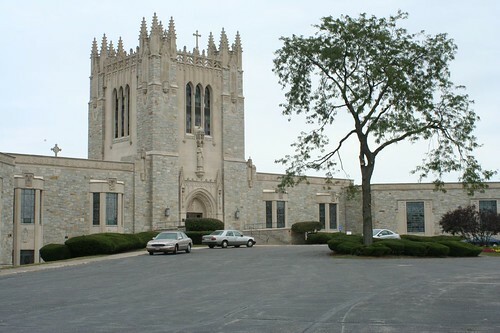 The Archdiocese also advertised the new facility on the same day. Later paintings were completed by Albert Henselmann and Italo George Botti. The building itself was designed in stages, with the Gothic central wing and its landmark tower coming first. Nothing in my research attributes the building to a particular firm, but it’s a fair bet that Detroit architectural firm Harley, Ellington and Day was responsible, as they did the subsequent west and south wings. 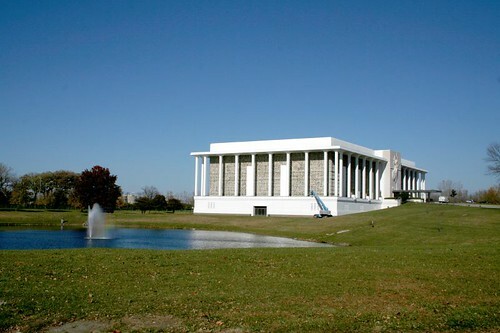 The central wing opened in spring of 1957, with room for 7,000 burials, 3 shrines, a main chapel and 4 supplemental chapels. 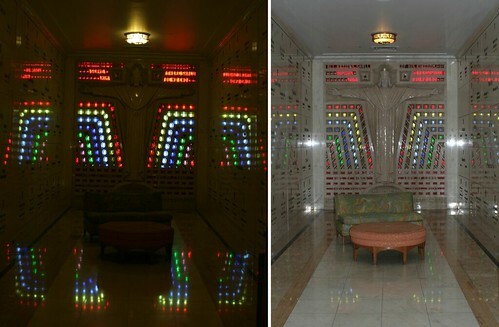 Its $4,000,000 construction cost was covered entirely by advance burial purchases. 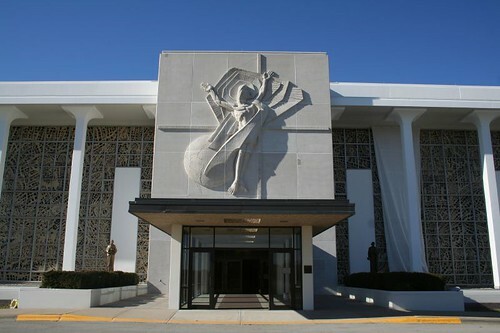 The central wing was followed in 1960 by the Queen of Angels wing to the south, designed by Harley, Ellington and Day in a slightly modernized Gothic style (HED was also responsible for the Neo-Formalist Resurrection Mausoleum in nearby Justice, IL.) 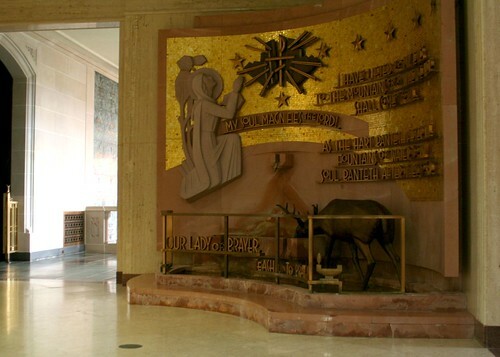 The large exterior statues on the two side wings were designed by sculptor Ferenc Varga of Detroit, and executed by Gaetano and Alfred Roselli, Italian-born immigrants who worked on the Tribune Tower decades earlier. 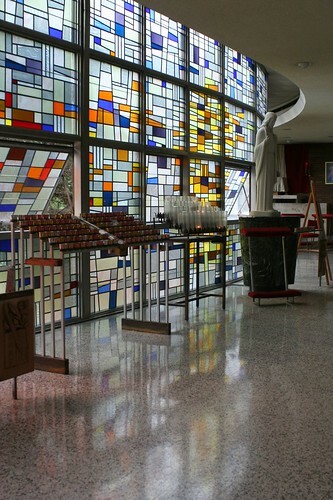 A third wing, Queen of All Saints, was designed by recently renamed firm of Harley, Ellington, Cowin & Stirton and completed in 1964, bringing the total capacity of the building to 30,000 interments. 45 years later, it’s only 3/4ths full, a testimony to its vast size. 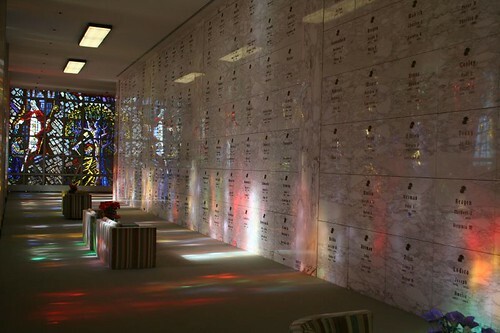 The mausoleum is intended to function as two buildings in one; the dead are contained within their own structure, with its own ventilation system. Despite that, more than a whiff of embalming fluid pervades the air. I spent nearly two hours exploring, and by the time I left I was quite ready to breath fresh air. But I left with regret. 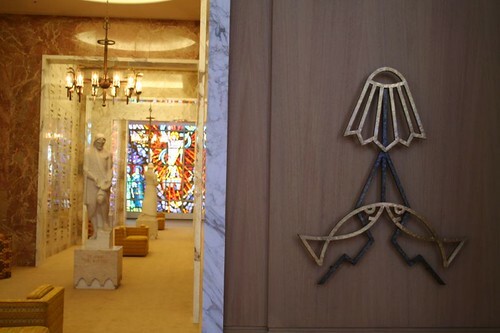 Queen of Heaven Mausoleum is a treasure trove of Midcentury art and design, some of it among the best and most creative I’ve seen anywhere. 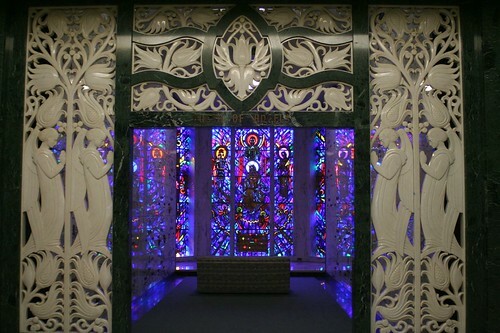 Some of the central pieces, just to cite one example, are these semi-stained glass bas relief sculptures. 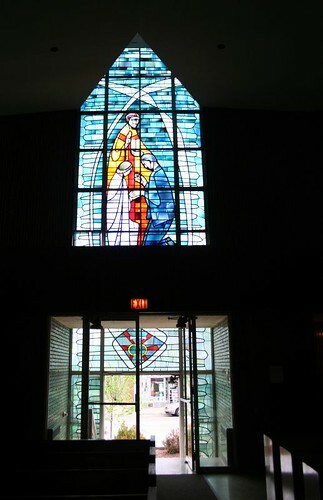 They appear in key points along the building, such as the main chapel, whose central window looms over the busy intersection of Wolf and Roosevelt. They seem to be executed in a hard painted plastic, with slits, cuts, and notches allowing strategic slits of light through. 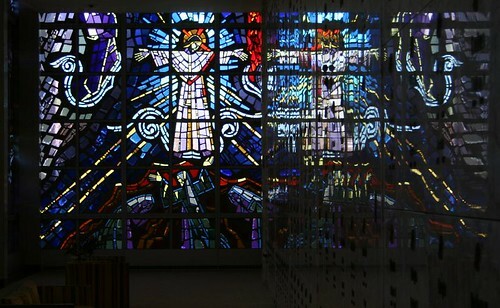 They are two-sided; the outside of the window gets a fully realized sculpture as well. 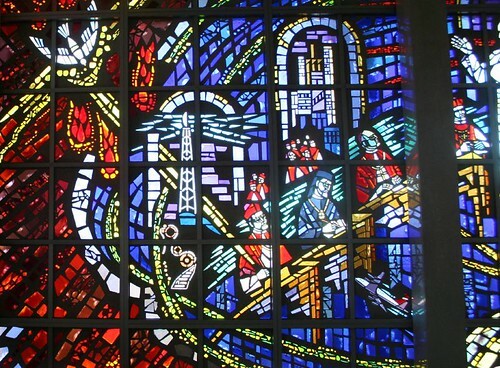 Unlike many stained glassed designs, there is no front or back to these works. 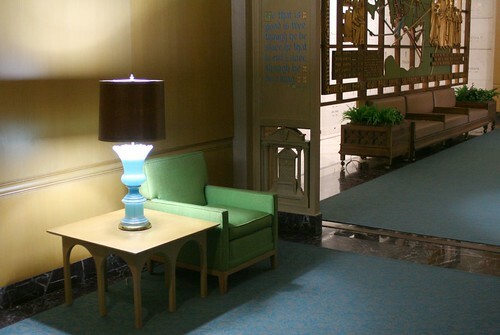 The sculptures are artwork in their own right, even when viewed under full light. In the dim light of the mausoleum, with the daylight streaming through them, they become something else, dark, backlit, haunting, foreboding, and magnificent… like the rest of the mausoleum. These photos and more may be seen at my Flickr account. 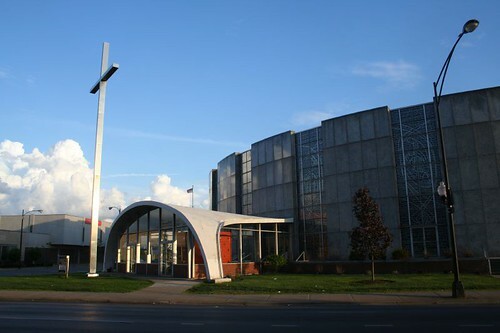 In 1956, this UFO of a building touched down at the busy intersection of 55th and Kedzie. It hovers there still today, a circular pie-slice of building fronted by a thin-shell concrete pod. Architects Pavlecic & Kovacevic designed a stridently Modern building, utterly free of historical associations in ornament or form. 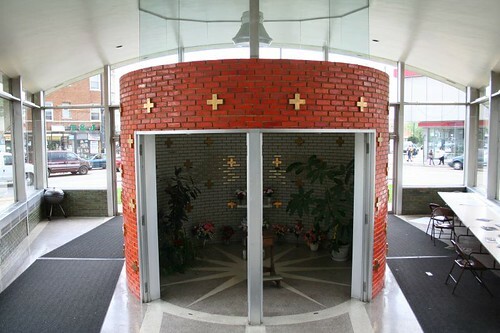 The baptistery is a building within a building, a circular form rendered in glazed orange brick, inset with gold-finished crosses. 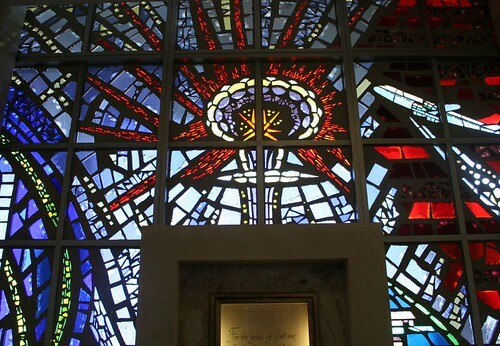 The stained glass is unobtrusively simple, not particularly groundbreaking, but adequately modern. 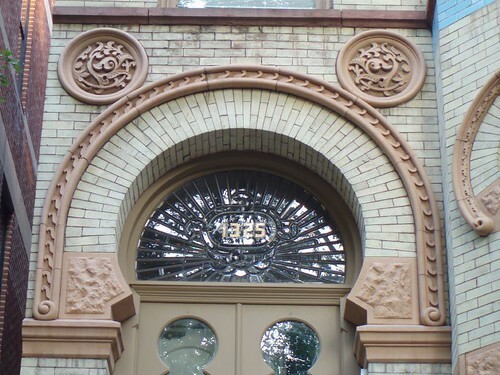 Quite a few ornate period details remain. 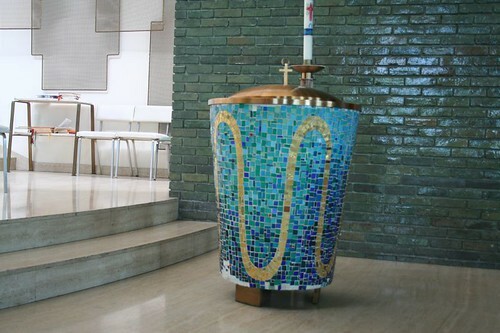 Check out the mosaic-tiled baptismal font, the grid of screens behind the altar, and of course that fabulously Fifties glossy blue-green brick. 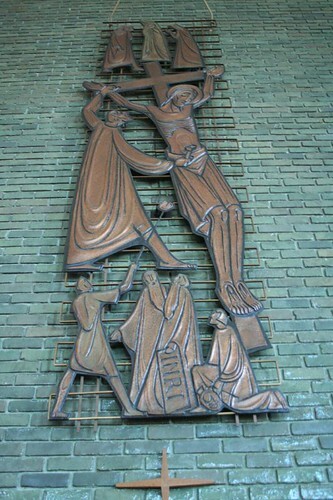 The Stations of the Cross are done in a more stylized fashion than the stained glass, more befitting this stridently jet age building. 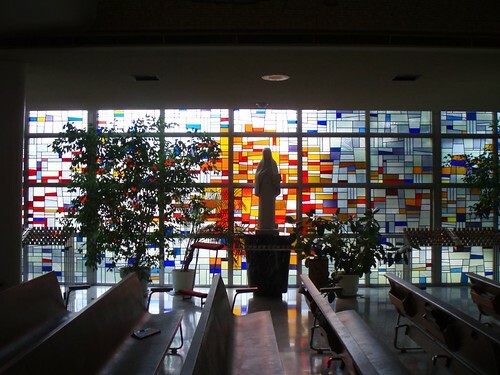 St. Gall is a shouting punctuation amid all the background paragraphs of the neighborhoods east of Midway Airport. 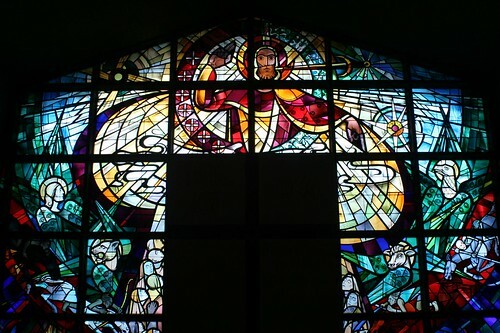 Link: A history of the church, with detailed information on this building, as part of a tour of church organs. When you have a ten mile commute across solid city, there’s a lot of ways you can go. Daily I discover different routes, new places I’ve never seen before or always wanted to find again. One such trip home this week turned up the Old Town stretch of Dearborn Street. 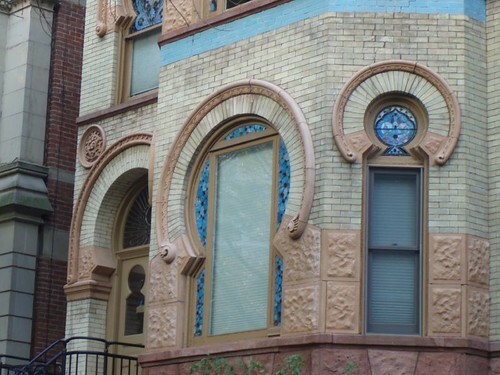 Together with its Rivernorth stretch, Dearborn is a cornucopia of Richardsonian Romanesque, which I intend to cover as soon as I can get the right photos. Meanwhile, here’s this little gem, on the leafy 1300 block. 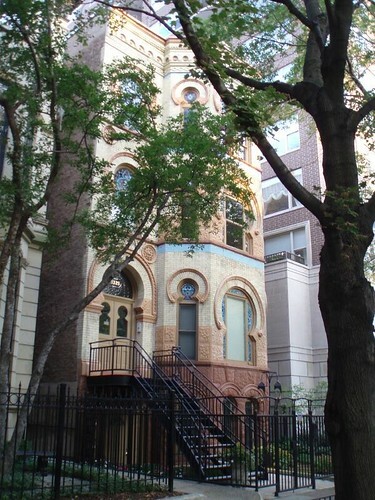 The handy-dandy AIA Guide identifies it as the Lucius B. Mantonya Flats, from 1887, by Curd H. Gottig. Lucius! Curd! 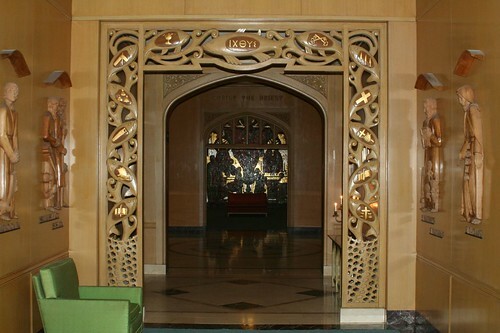 Moorish arches, with the little bit of return curve at the bottom, give it an exotic flair. 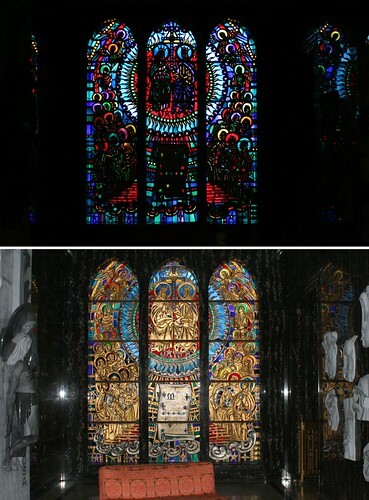 Stained glass and leaded glass adorn the many windows. It’s a diamond among rubies in this tony and historic section of town.